Our passion at The DIY Joint is to empower our students and customers with the same feeling and ability that we have received from the craft of woodworking. All skill levels – beginner, intermediate, expert, hobbyist – are all welcome here for our classes, or perhaps using our facilities for open studio time. At The Joint, we have an assortment of tools and equipment to help you woodwork in any way you wish. If you take a carpentry class, you’ll create your very own Edison style industrial street lamp which you can take home at the end of the class to decorate your home, with your own handiwork! While you make the Edison Table Lamp, you will learn how to wire the lamp, from the socket down to the plug-end, and we will show you how to use a table saw, drill press, and even router. This is just one of the many woodworking classes we offer, and it’s absolutely perfect for beginners. At The DIY Joint, we strive to create a no pressure, educational, and fun environment for our woodworking courses. 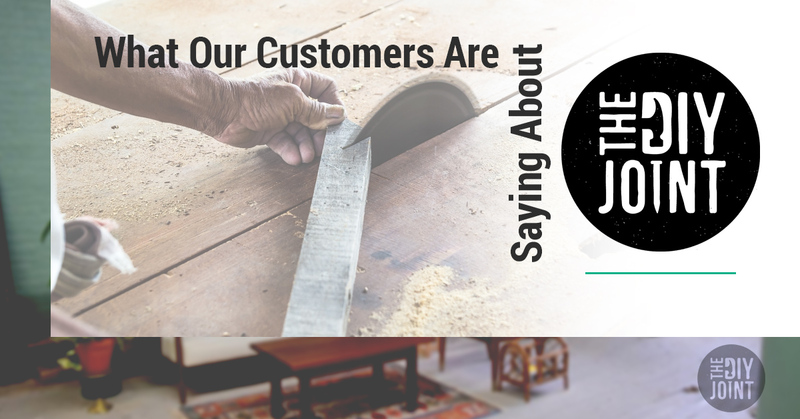 But before we get too carried away talking about all of our favorite classes and projects, let’s hear from what our students and customers have to say about The DIY Joint. Thanks Jessica! Jessica was part of our Milling Lumber: Cutting Board woodworking course. Over the span of three weeks Jessica learned how to select wood from a lumberyard, and was taught how to use an assortment of woodworking equipment. Alex has taken our shop safety woodworking class for beginners, which is a great way to familiarize yourself with our wide selection of tools, including a drill press, disc sander, and bandsaw. We are so happy our students like Chelsea, Alex, and Jessica all have had great experiences at The DIY Joint. If you are wanting to learn carpentry, or perhaps have just had a vague angst about yourself lately (maybe from staring at your phone and pounding on the keyboard too much), we would love if you looked into some of our projects and classes we are offering. Check us out! Subscribe to our newsletter to receive $10 off your first class! ©2019 The DIY Joint | All rights reserved.